Synthetic peptide conjugated to KLH derived from within residues 300 to the C-terminus ERK1 + ERK2. This antibody gave a positive signal in human liver and kidney tissue lysates, and in the following whole cell lysates: HeLa; A431; PC12; NIH3T3; THP1; HepG2. Our Abpromise guarantee covers the use of ab94484 in the following tested applications. WB Use a concentration of 1 µg/ml. Detects a band of approximately 42, 44 kDa (predicted molecular weight: 42, 44 kDa). Additional bands at: 120 kDa, 130 kDa, 35 kDa. We are unsure as to the identity of these extra bands. ICC/IF image of ab94484 stained MCF7 cells. The cells were 4% PFA fixed (5 min) and then incubated in 1%BSA / 10% normal goat serum / 0.3M glycine in 0.1% PBS-Tween for 1h to permeabilise the cells and block non-specific protein-protein interactions. The cells were then incubated with the antibody (ab94484, 5µg/ml) overnight at +4°C. 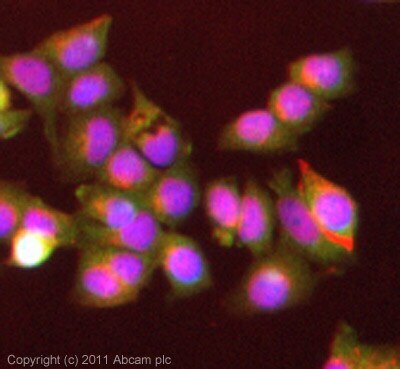 The secondary antibody (green) was ab96899, a goat anti-rabbit DyLight® 488 (IgG; H+L) used at a 1/250 dilution for 1h. Alexa Fluor® 594 WGA was used to label plasma membranes (red) at a 1/200 dilution for 1h. DAPI was used to stain the cell nuclei (blue) at a concentration of 1.43µM. 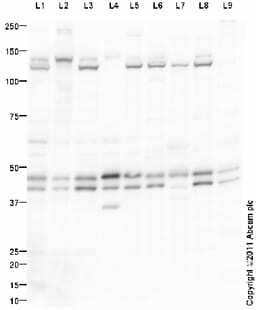 This antibody also gave a positive result in 4% PFA fixed (10 min) HeLa cells at 5µg/ml. ab94484 has not yet been referenced specifically in any publications. 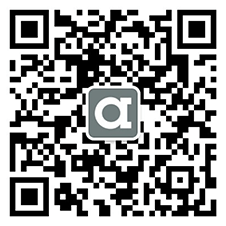 There are currently no Customer reviews or Questions for ab94484.